For all their promising technologies, daily living in North America (and increasingly elsewhere across the globe) for many people remains less convivial, lonelier, less collaborative, and generally less community-spirited than enjoyed at other times and in other places. Many citizens now quest for a sense of community or its surrogates in forms of identity, volunteering, various kinds of spirituality, or the pseudo-intimacy of television. While other scholars have already argued that certain areas of everyday life should be reformed to better promote more community-oriented living arrangements and well-being, their research has focused fairly narrowly on a single factor contributing to a sense and experience of social isolation, like the design of neighborhoods, the length and flexibility of work hours or how people communicate, eat, or socialize. Furthermore, a wider implementation of community-friendly built environments, social practices and exchange activities has been slow and stuttering, suggesting the existence of inhibitory socioeconomic, political or technological barriers. Like concepts such as freedom, democracy or sustainability, the notion of community is fuzzy and infinitely contestable. Some, no doubt, view the term with a great deal of suspicion, associating it with narrow-minded parochialism and perhaps even early 20th-century European fascism. Nevertheless, I believe there is some value to not only talking about community but also seeking to better promote communal interaction. It is in no way preordained that vibrant and socially just ways of doing "thick" community are not possible. I take thick community to be the the presence of structures and practices that promote social bonding via dense and multi-stranded webs of ties, encourage local functional-interdependence, and help produce deep psychological sense that one belongs to, acts within, and is obliged to contribute towards some socio-geographic entity larger than oneself. Community as a social structure, moral practice and psychological sense can be thought of as a vector outcome of dispositions, habits of thought, artifacts, built environments, infrastructures of good and service provision, economic interdependencies and political interactions. However, as accounts of the emergence of the "network society" and "networked individualism" make clear, the context of contemporary living is often more compatible with diffuse, compartmentalized, single-stranded, and ultimately individualistic forms of social bonding than communitarian forms of association. Nonetheless, networked sociality is neither preordained nor inevitable. I consider this outcome a mostly unintended result of a particular arrangement of sociotechnical systems, behavioral incentives, and emergent cultural norms. Put simply, contemporary social life could be otherwise. 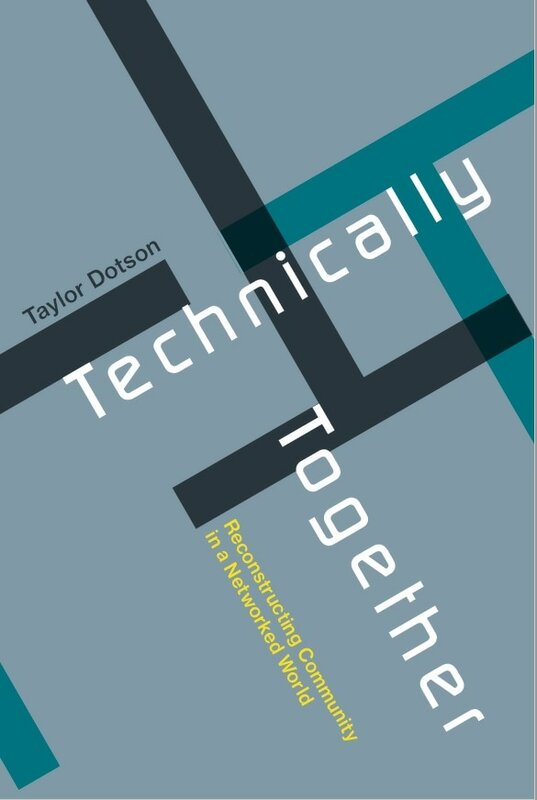 My book, Technically Together, examines just how technological civilization could be reconstructed to be better compatible with more communitarian forms of life. How could streets, neighborhoods, cities, organizations, systems, and gadgets be more communitarian? How could they better center or ground the lives of residents within an local social ecology? By examining the politics of the technologies that that appear to shore up or constrain communitarian social patterns, I describe how citizens might rediscover and enable more communal ways of being and relating.